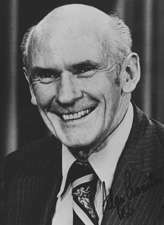 Alan MacGregor Cranston (June 19, 1914 – December 31, 2000) was an American politician and journalist who served as a United States Senator from California, from 1969 to 1993. Cranston was born in Palo Alto, California, the son of Carol (née Dixon) and William MacGregor Cranston. He attended Pomona College and the Universidad Nacional Autónoma de México before graduating from Stanford University in Palo Alto in 1936. Cranston was born into a well-to-do family from Northern California with interests in real estate. He married and divorced twice. His first wife, Geneva McMath, was the mother of his sons, Robin, who died young in an auto accident, and Kim, who survived him. Cranston was later married to Norma Weintraub. Cranston was a correspondent for the International News Service for two years preceding World War II. When an abridged English-language translation of Adolf Hitler's Mein Kampf was released, sanitized to exclude some of Hitler's anti-semitism and militancy, Cranston published a different translation (with annotations) which he believed more accurately reflected the contents of the book. In 1939, Hitler's publisher sued him for copyright violation in Connecticut; a judge ruled in Hitler's favor and publication of the book was halted. Before enlisting in the armed forces in 1944 as a private (he held the rank of sergeant at his discharge), he worked as an editor and writer for the magazine Common Ground and later worked in the Office of War Information. The following year he wrote a second book, The Killing of the Peace, a synopsis of the failed bid to get the United States to join the League of Nations immediately following World War I.
Cranston, a supporter of world government, attended the 1945 conference that led to the Dublin Declaration, and became president of the World Federalist Association in 1948. He successfully pushed for his state's legislature to pass the 1949 World Federalist California Resolution, calling on Congress to amend the Constitution to allow U.S. participation in a federal world government. Also in the late 1940s, Cranston began his longstanding opposition to nuclear weapons. In 1952, Cranston co-founded the California Democratic Council (CDC), and served as chairman. Since that time, the CDC has served as an unofficial coalition of local Democratic clubs that coordinate electoral activities and activism throughout California. The CDC provided substantial support to Cranston in his bid for State Controller in 1958 and his numerous runs for the U.S. Senate. A Democrat, Cranston was elected California State Controller in 1958 and re-elected in 1962. In 1968, he was elected to the first of four six-year terms United States Senate, defeating Republican Max Rafferty in the general election after the staunchly conservative Rafferty had defeated the liberal Republican incumbent, Thomas Kuchel, in that party's primary. The general election itself was also marred by mudslinging. A conservative writer, Frank Capell, authored a pamphlet suggesting that Cranston may have had Communist leanings in his youth, and that during his stint at the Office of War Information he helped falsely convince Franklin D. Roosevelt that Nazi Germany had perpetrated the Katyń massacre. 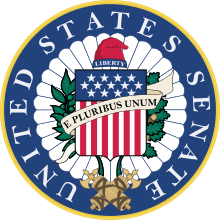 Many of the same allegations were recycled in an article that ran in American Opinion in 1974 entitled "Alan Cranston: The Shadow in the Senate". (The article's title was a reference to Lamont Cranston, the name of the main character in the popular radio program The Shadow). In 1974, Cranston defeated Republican H.L. "Bill" Richardson, a conservative state senator previously affiliated with the John Birch Society. Cranston polled 3,693,160 votes (60.5 percent) to Richardson's 2,210,267 (36.2 percent). In 1980, Cranston defeated Republican Paul Gann, 4,705,399 (56.5 percent) to 3,093,426 (37.1 percent). His 1980 reelection campaign was notable for a July 31 benefit that would be the last concert The Eagles played at together for 14 years. During the event Cranston's wife thanked Eagles guitarist Don Felder for performing, to which Felder reportedly replied, "You're welcome...I guess." Bandmate Glenn Frey took exception to Felder's comment, leading to onstage bickering and the breakup of the band immediately following the concert. The New York Times characterized him as a "bald, craggy-looking, none-too-charismatic man." Cranston was elected again in 1986 defeating Republican nominee Congressman Ed Zschau. Cranston was Democratic Whip from 1977 to 1991. He was an unsuccessful candidate for the Democratic presidential nomination for the 1984 election. He became the first announced candidate on February 1, 1983. Despite his age (69) and appearance that seemed even older (he dyed his little remaining white hair a color that most called orange), Cranston quickly became a recognized candidate. His strong support for a nuclear freeze won him an intense following among anti-nuclear activists, support that translated into campaign donations, committed staff (future Washington Senator Maria Cantwell moved to the state in 1983 to head up Cranston's caucus campaign effort there) and volunteers and straw poll victories in Wisconsin, California, and Alabama. However, the entry of George McGovern into the race in September 1983 cut into Cranston's support. He finished a weak fourth in Iowa in February 1984 and dropped out a week later after finishing seventh out of eight candidates in New Hampshire, with only 2 percent of the vote. Cranston also faced a campaign debt of $2 million from his 1984 run as he began gearing up for an expensive and tough re-election fight in 1986, when he narrowly defeated the liberal Republican U.S. Representative Ed Zschau, who later left the Republican Party. Cranston was reprimanded by the U.S. Senate Select Committee on Ethics for "improper conduct" on November 20, 1991 after Lincoln Savings head Charles Keating's companies contributed $850,000 to voter registration groups closely affiliated with the senator. Keating had wanted federal regulators to stop "hounding" his savings and loan association. Although the committee found that "no evidence was presented to the Committee that Senator Cranston ever agreed to help Mr. Keating in return for a contribution," the committee deemed Cranston's misconduct the worst among the Keating Five. Cranston decided against running for a fifth term while he battled prostate cancer. Throughout his public life, Cranston was notable for practicing and participating in the sport of track and field as a sprinter in special senior races. Many of the events, races for senior sprinters at major track meets, were the early events that became the sport of Masters athletics. While on his many political trips, Cranston would spend time sprinting in long hotel hallways to maintain his fitness. He dedicated his retirement to the global abolition of nuclear weapons, first through the Nuclear Weapon Elimination Initiative of the State of the World Forum, and then as President of the Global Security Institute, which he founded in 1999. He lived in Los Altos, California, from his retirement until his death on December 31, 2000. Wikimedia Commons has media related to Alan Cranston. ↑ "Alan Cranston, Former U.S. Senator, Is Dead at 86". The New York Times. January 1, 2001. ↑ Farrell, Harry (November 21, 1999). "Out of the limelight, former U.S. Sen. Cranston fights a battle for peace". San Jose Mercury News. Archived from the original on August 15, 2000. ↑ Jonathan Schell (January 4, 2001). "Alan Cranston". The Nation. ↑ "The 10 Messiest Band Breakups". Rolling Stone. Retrieved 13 August 2013. ↑ Ellwood, Alsion (Director) (January 19, 2013). History of the Eagles Part One (Documentary). Showtime. ↑ "Alan Cranston, Former U.S. Senator, Is Dead at 86". New York Times. 1 January 2001. Retrieved 10 October 2014. ↑ Bock, Alan: Eye on the Empire, Antiwar.com.